One of the most influential fashion designers of 20th century, Coco Chanel was born in Saumur, France in 1883 on August 19. Her sense of sophistication and taste for best and luxurious apparel placed her among the most respected as well as graceful stylish icons. Her timeless design suits, especially her trademark product-little black dress, are still prominent among stylish women and fashion world. Before her career as a fashion designer, she had a concise career of a singer at different clubs where she promoted herself with her self-called name “Coco”, which, according to the article in The Atlantic, was taken from one of the songs she used to sing in clubs. The early death of her mother landed her into an orphanage by her father, who was a peddler. She was taught how to sew by nuns there and her interest aroused and mastered over the task. In her early 20, she got herself involved with a French, ex-cavalry officer, and wealthy textile heir Étienne Balsan who assisted her in making her dream come true by opening her first fashion shop on Paris’s Rue Cambon in 1910 and she started selling stylish hats. Her first success came from the idea of creating loose and relaxing women’s dress she fashioned out of an old jersey on a chilly day during 1920s and very soon the tight and stiff clothing became very impractical and old fashioned. In 1920, she launched her most famous design Chanel’s little black dress. In 1925, she launched the graceful legendary Chanel suit with collarless jacket and well-fitted skirt, which became revolutionary product for the time in her designing career. She became a very famous icon in the Paris literary as well as artistic worlds and got designing offers for reputed names including Cocteau, Pablo, the Ballets Russes and for Jean Cocteau’s play Orphée. In 1930, the growth of her company slowed down due to the international economic depression but she successfully returned at the age of 70 and once again won the heart of her customers across the world. In early 1971, Chanel died on Sunday, on 10th January at the Hotel Ritz where she stayed for over thirty years. In 1922, Coco Chanel introduced the first ever perfume mixed of natural extracts and artificial essence named Chanel No. 5 to the global market. In 1926, Coco Chanel designed and launched the “Little Black Dress” which was nicknamed as “Chanel’s Ford” by French Vogue. 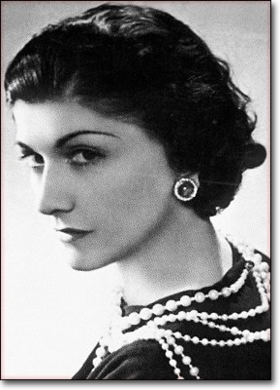 Coco Chanel was primarily responsible for developing the concept of applying jersey fabric to create and adorn clothing for women’ undergarments. The stylish flattering cut, simple but pleasing fabric, and gracious look of Coco Chanel suit made it so famous and perfect choice of women. The brand Coco Chanel is best-known for outfit jewelry, quilted stylish bags, two-tone shoes, and simple suits of jersey. The most courageous act is still to think for yourself. Aloud!